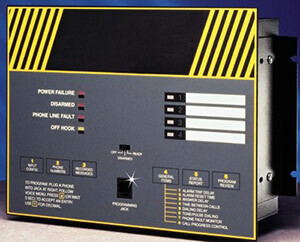 The OMA-GUARDIT automatic alarm dialer monitors 4 input channels. Each channel can be configured for an analog or digital signal input. The system utilizes the public telephone network as a basic medium for transmission of alarm messages and status calls. It is field programmable by the user at the system's control panel via a standard touch tone phone handset. Upon detection of an alarm condition, OMA-GUARDIT automatically calls a list of up to 8 pre-programmed phone numbers over the standard dial-up telephone network, calling until it gets an acknowledgement. When a connection is made, the system reports the station identity and the specific alarm condition in the form of a digitally pre-recorded voice message. In addition to standard phones in office, plant, or home, the alarm calling sequence can also include calls to pagers, cellular phones, and voice mail. The voice transmission consists of a station identification together with an alarm message giving details on the fault. The station identification and alarm messages are digitally recorded by the user. By using electronic voice reporting technology, OMA-GUARDIT eliminates the need for often unreliable audio tape autodialers. OMA-GUARDIT fills the requirement of a modern autodialer–it should be extremely reliable and be able to tell the called party as much information about the nature of an alarm as possible so that the right personnel can respond quickly and appropriately. Many other autodialers don’t meet these requirements. 참고: OMA-GUARDIT comes with complete user's manual.